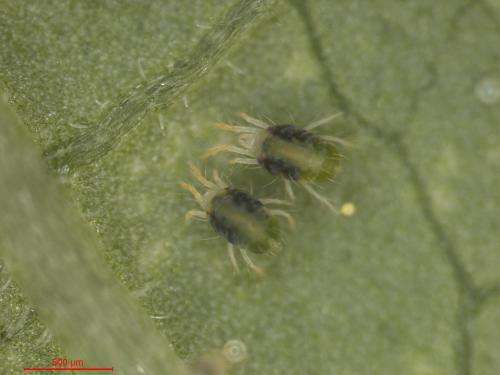 Two females on bean leaf. (Phys.org) —A new, natural nanomaterial, which may prove incredibly beneficial to medical bioengineers, has been discovered by the research team at Western University that successfully sequenced the spider mite genome in 2011. The findings were published in Journal of Applied Physics. "One of the discoveries spinning out from our sequencing of the spider-mite genome was spider-mite silk," explains Grbic, regarding the findings published in Nature in 2011. "When we conceived this project, our idea was to develop tools to control this important world-wide pest but we didn't even dream that we were going to discover a potential bionanomaterial naturally produced by the spider-mite." Due to the near infinitesimal size of the spider mite silk, traditional theories were irrelevant so Hutter and Steve Hudson from the Department of Physics & Astronomy were forced to rethink conventional methods used for measuring the mechanical properties of nanomaterials. "Basically you measure the strength of a nanofibre by anchoring it at both ends, suspending it, and then bending it with an atomic force microscope," explains Hutter. "These fibres were so thin that the conventional theory didn't apply and we had to develop a new theory to understand the data." Hutter and Grbic are most excited that spider mite silk has proven to be a truly natural nanomaterial, making its practical applications numerous. "Spider silk, which people often talk about, has similar properties but it doesn't score quite as high on Young's modulus," says Hutter, explaining the scientific measure used to characterize stiffness in elastic materials. "Plus spider mite silk is way thinner." Grbic says potential applications would require further research but could include construction of scaffolding for cell growth, as well as tissue regeneration and transplantation.